Our project involved the characterization of different promoters as well as their signaling inputs. We want to share the sequences encoding the main parts of our CARTELTM AND gate. Future iGEM teams will have the opportunity to take advantage of our research if they are planning to work with pH, hypoxia as well as VEGF. Most of the sequences were obtained by literature research and have been synthesized by Integrated DNA technologies, engaging their special offer for iGEM teams. Some of the sequences were also purchased from addgene and have been amplified via PCR. 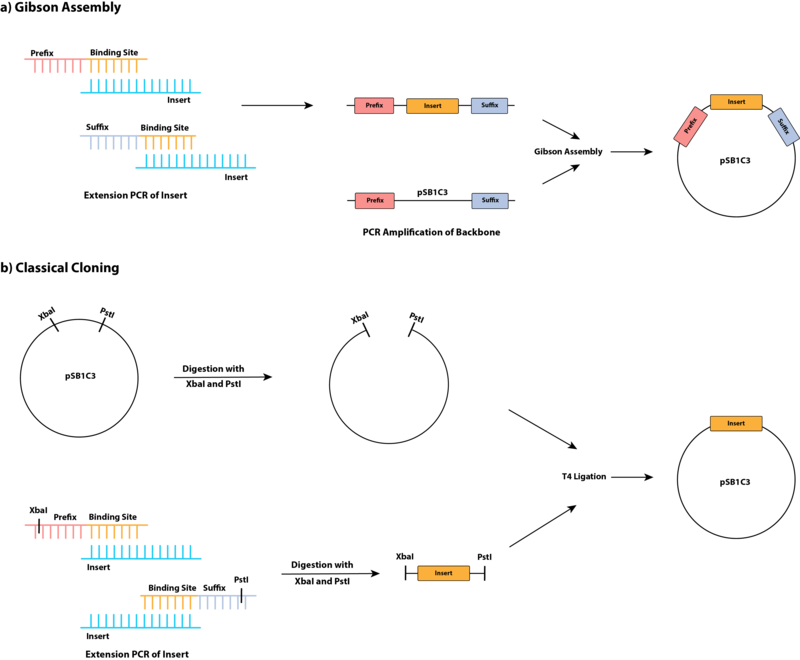 Forbidden recognition sites for restriction enzymes used for BioBrick RFC standard cloning have been removed without causing amino acid changes. Cloning our inserts into pSB1C3, was done using extension PCR, T4 ligation and Gibson Assembly. Figure. 1: Cloning strategies of BioBricks. All our BioBricks are summarized in the table below (Tab. 1). The table guides you to more detailed info pages as well as to the corresponding registry pages. We used not only the enhancer elements as single regulatory units, but created multiple enhancer elements. Increasing the amount of enhancer elements results in an upregulation of transcription downstream of the minimal promoter. This allows highly specific tuning in target cell types. We thereby create the chance for other iGEM teams to use our BioBricks and adjust them to their individual needs. This can be easily done by using compatible end assembly, which is possible due to a BglII restriction site contained in BBa_K2295003. Our favourite part is the CRE promoter, a cAMP dependent promoter. Being one of the main downstream signaling pathways of Gs coupled G protein coupled receptors (GPCRs), this BioBrick supports the combination with a wide range of other parts. The iGEM BioBrick library already contains several Gs coupled GPCRs. Depending on the GPCR, different inputs can be used for ligand dependent gene expression. One example for the usage of BBa_K2295001 has been shown in our project with the TDAG8 Receptor (BBa_K2295000), allowing pH dependent gene expression.